All transactions are safe and secure with a reliable history in online purchasing behind each of our associates. Buy the Monk's Top Ten Phobias t-shirt to own Monk clothing and merchandise. We all know the star of the Monk TV show on the USA Network has millions of fears and phobias, but do you know which top the list? Not many people do. The back of this official Monk t-shirt clarifies the answer to this question with a list of Monk's top ten phobias. 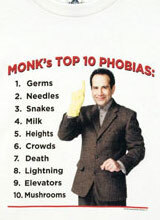 I never realized that Monk's fear of milk ranked so highly in his mind, coming in a remarkable fourth place. The front displays the classic Monk logo and the tagline "The Obsessive Compulsive Detective". Just as Monk never goes wrong, you can't go wrong with these Monk t-shirts. In addition to the Monk's Top Ten Phobias tee above, browse the Monk Clothing Gallery for more apparel like men's and women's clothes, kids shirts or hoodies.